Corporate Events & Company Picnics & More! 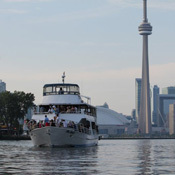 Impress your clients and reward your staff with a relaxing cruise around the Toronto Harbour and through the Toronto Islands on the sleek-styled and luxuriously appointed private yacht, Miss Toronto. Chartered by many of Canada's Fortune 500 Companies, Miss Toronto enjoys the reputation for outstanding service and attention to the smallest detail. Our uniformed and enthusiastic crew are committed to ensuring that your event is a huge success! "Thanks for everything and your help with my Big 50th Birthday Party. Your crew, the food and the atmosphere was simply perfect! Jose was very helpful with the Sky Lanterns and made sure everyone and everything was safe. Everyone loved your mascot too. I'm sure we and my friends with be enjoying your vessel again. I can't Thank You enough for all you did and your patience too. If the scenic lagoons of the Toronto Islands, the impressive views of the city's skyline, fabulous food, boats drifting off in the distance, or dinner and dancing to the infectious beats from our DJ isn't enough, additional entertainment can be provided. A corporate cruise can be a compelling promotional event for your customers, or as "staff appreciation" by rewarding your employees with a company picnic cruise, or perhaps a dinner and dance. Let us entertain you with a theme cruise or an activity-based event. We also have a wide variety of menus available and perhaps a special cocktail invented and named specifically for your event. Special dietary requests are never a problem. View our list of recent, very satisfied corporate clients. 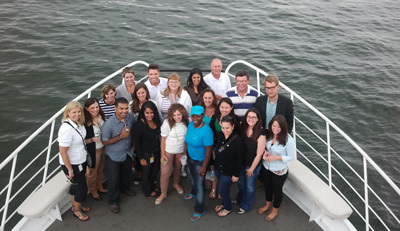 Plan your fantastic corporate getaway with Miss Toronto today.